As one of the leading research universities in the nation, UMD is at the forefront of progressive research. The effort to maintain this kind of excellence requires dedicated faculty and talented graduate students, working together with partner organizations, to extend and refine the University’s research capacity. For more than a decade, UMD has been working with the National Cancer Institute (NCI) to coordinate research agendas with the goal of finding breakthroughs, and expanding each entity’s investigative skill set. NCI is one of 27 programs within the National Institutes of Health (NIH), and has extensive facilities in Bethesda and Frederick, Maryland. NCI coordinates national cancer research, supporting training and education related to the causes, prevention and treatment of cancer. Of all the centers and institutes in NIH, NCI has the largest budget, and most comprehensive research program receiving billions of dollars in funding each year. The UMD-NCI partnership started through an informal discussion in 2005 between the Physics Department’s Wolfgang Losert, and then-chair Andrew Baden, linking NCI’s David Levens and James McNally. The brief conversation led to a larger meeting with ten representatives from each institution where each side shared research interests, and found common ground for further collaboration. Fortunately, the then-head of NCI, John E. Niederhuber, was very interested in linking physicists to NCI, and very quickly approved six summer graduate student internships. “The six internships turned into six ongoing projects, and soon Jim, Dave and I were working on formalizing the partnership,” recalls Losert. By 2010, the partnership was officially established. Since then, over 40 graduate students with complementary expertise have worked with joint UMD/NCI researchers on some of the most progressive and interdisciplinary cancer research in the world. These students have come from ten different graduate programs working with more than 60 mentors from both institutions--some even at other NIH institutes where this collaborative model has been replicated. “By linking expertise in computer science, mathematics and engineering to basic clinical and translational research and the expertise at NCI, we are able to build a sustainable and highly successful partnership. And the glue, or as a colleague calls them the ‘gluons,’ are the graduate students who participate-–learning, being mentored at both places and linking expertise directly. For example, we have amazing bioengineers building bio-devices, and then that student then works at NCI with that device in the most impactful context,” says Losert, now Associate Dean for Research and Graduate Education in the College of Computer, Mathematical, and Natural Sciences (CMNS). “When we formalized the agreement, we intentionally wanted to keep it broad so that other disciplines at UMD could pair with the needs of NCI-–such as, biophysics, applied math, biochemistry, engineering, computer science and beyond,” he adds. Over the years, UMD/NCI alumni have gone on to assume prestigious postdoctoral fellowships, including three at Harvard University’s various institutes/units. One of these individuals is John Platig (’13 PhD, Physics). He was one of the early or ’seed’ participants in the UMD/NCI partnership. His research focused on computational biology with an eye on developing systems genetics models of complex disease traits. While a graduate student, Platig applied for and obtained a Cancer Research Training Award from NCI to combine information theory and network measures to identify master regulators in a lymphoma regulatory network reconstructed from gene expression data. He credits the UMD/NCI experience with informing his current research focus, which includes gene regulatory network reconstruction, analytical estimates of network errors, multi-omic data integration, and modeling genetics in regulatory networks. "My graduate training provided by the NCI/UMD program prepared me for both the analytical challenges of developing network-driven hypotheses derived from real data and translating statistical and quantitative results into biological understanding,” remarks Platig, now an Associate Scientist and Medical Instructor at the Harvard Medical School and Brigham and Women’s Medical Hospital in Boston, Massachusetts. Noam Auslander (‘18 PhD, Computer Science), a more recent graduate of the partnership, is currently a Visiting Fellow at NCI’s Cancer Data Science Lab. “I was fortunate to work with Thomas Ried’s lab as a part of the program. We worked together on multiple projects from which I have greatly benefitted; I had a chance to work on clinically relevant problems for which the team collected data. The close collaboration within the group also provided an indispensable understanding of the clinical questions that we were working on, and taught me what I may contribute in practice, which motivated the selection of computational approaches. Together, we managed to improve the clinical annotations of the data, and enabled us to make predictions using it,” observes Auslander. Presently, there are 16 graduate students on UMD/NCI support. Many of these awards are a result of an annual competition between a team of NCI/UMD faculty and a graduate student to fund a new three-year seed project. The Graduate School splits tuition support with NIH for each program participant. In addition, there are ten other students being supported through other mechanisms within the partnership at other NIH institutes. 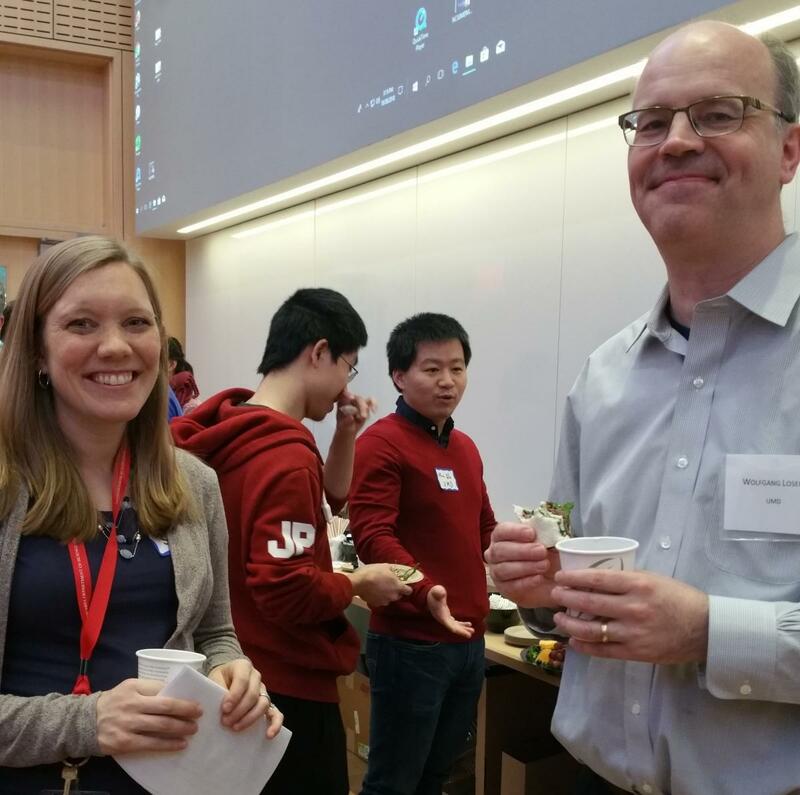 “We are pleased to support faculty and graduate student collaborations in prominent labs here and at NIH. Everyone benefits from this kind of knowledge exchange,” says Jeffrey Franke, Assistant Dean and Chief of Staff at the Graduate School. The current leadership of UMD’s Wolfgang Losert and Doron Levy and NCI’s Grégoire Altan-Bonnet and Dan Larson express the way the character of the partnership has evolved in the last 12 years. NCI has since hired a number of investigators with computational and physics expertise, which has resulted in new kinds of collaborations. “To me the goal of the program was to foster a much stronger relationship with NIH’s research enterprise, and graduate students are the essential element to that. The application of computer science and engineering, math and physics principles to cancer research is no longer something that we as a university faculty have to convince NIH collaborators as useful. NCI to this day continues to be eager to work with our faculty and students-–the new methods our graduate students bring and their complementary skills continue to lead to a lot of new projects. But I feel like we have just scratched the surface. We are a large research university and the NCI/NIH intramural research is a $3 billion research enterprise with thousands professional researchers. The amount of data that could benefit from analysis and modeling, the amount of engineering and biological expertise we could contribute means that the partnership still has a significant amount to grow. I also hope that this model will spread and we will be able to develop seed programs with other institutes over time,” concludes Losert.